Melbourne's skyline as viewed from the Rialto Observatory on Collins Street. The satellite view shows Melbourne, Australia's second largest city (by population), a major port and the capital and most populous city of Victoria, one of the six states of Australia. Melbourne is located on the traditional land of the Kulin Nation in the south-eastern part of mainland Australia on the Bass Strait opposite Tasmania at Port Phillip Bay. 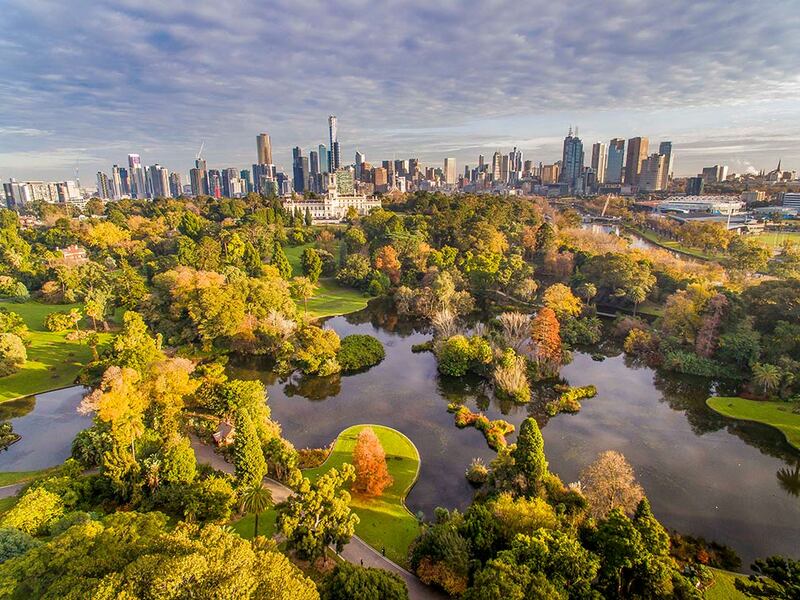 View over Melbourne Gardens and Ornamenal Lake with the city of Melbourne in the background. For the Kulin Nation, Melbourne has always been an important meeting place and the location for events of social, educational, sporting and cultural significance. The modern city was founded in 1835. In its early days, Melbourne was a rural town. Since its European settlement, different nationalities have migrated to Melbourne at various stages of its history. The first church, the Cathedral Church of St James opened its service in 1837. The first fixed bridge, the Princes Bridge over the Yarra River was officially opened in November 1850. The city became state capital in 1851 and was the capital of Australia from 1901 until 1927. The Victorian gold rush between 1851 and the late 1860s, made Melbourne one of the largest and wealthiest towns in the World. Today the Greater Melbourne metropolitan area has a population of about 4 million people. Since 2002 The Economist magazine ranked Melbourne consistently amongst the World's Most Livable Cities. 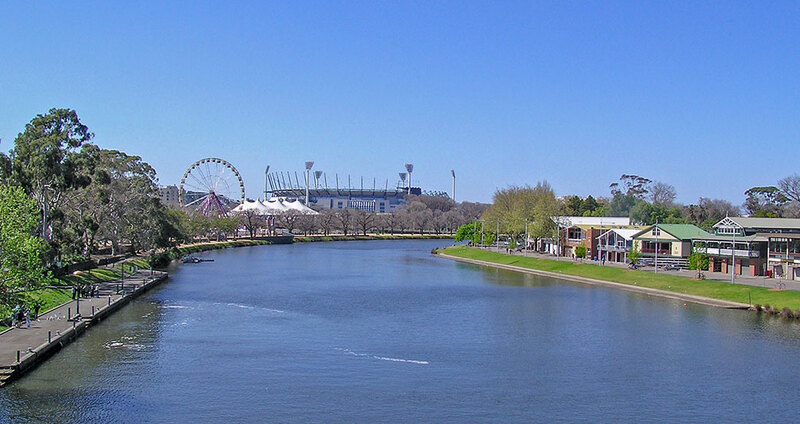 Viewed from Princes Bridge, Melbourne's Yarra River, Melbourne Cricket Ground in the background and a temporary Ferris Wheel that was set up in Birrarung Marr. To the left of the photo is Federation Square and to the right are the boatsheds of various rowing clubs and private schools. Federation Square, the block-sized plaza is a venue for arts, culture and public events on the edge of the CBD of Melbourne. Queen Victoria Market, is the largest open-air market in the Southern Hemisphere. Many of the original market structures of the 19th-century market remain intact, presenting visitors historical streetscapes and a working market atmosphere. Collins Street, city feeling with numerous heritage buildings, old street trees, and high-end shopping boutiques. Flinders Street railway station, the iconic, domed railway station and metro hub was opened in 1909; it serves the city's entire metropolitan rail network. Royal Botanic Gardens Victoria, large botanic gardens in the heart of the city. National Gallery of Victoria (www.ngv.vic.gov.au), Australia's oldest, largest and most visited art museum offers a vast collection of noted Australian and international art and artifacts dating back to the first century. Arts Centre Melbourne (www.artscentremelbourne.com.au), a complex of theaters and concert halls by the Yarra River in the Melbourne Arts Precinct. Melbourne Star, 120 m (394 ft) tall Ferris wheel with 360-degree views in glass-enclosed cabins, located in the city's Waterfront City precinct. Port Phillip, the large bay is one of Victoria's most popular tourist destinations, ideal for swimming, snorkeling, scuba diving, kitesurfing, windsurfing, and sailing, it is home to a number of marinas and yacht clubs. The Yarra Valley, a popular day-trip and tourism area, featuring the Lilydale to Warburton Rail Trail and a range of natural attractions and agricultural produce, the valley is home to a thriving wine growing industry. Just zoom in (+) to see Eureka Tower, 297.3 m (975 ft) tall, the second tallest building in Australia, for some years it was the tallest residential building in the world. The tower offers city vistas with a complete 360 degree, floor-to-ceiling views encompassing Melbourne's CBD. The Map shows a city map of Melbourne with expressways, main roads, and streets, zoom out to find Melbourne Airport (IATA Code: MEL) located about 23 kilometers (14 mi) north-west of the city center. Google Map: Searchable map and satellite view of Melbourne, Australia. City of Melbourne official web site.